Before supermarkets there were hedgerows. Instead of picking a bottle of a cordial off a shelf, you first picked the elderflower heads. Rather than putting some onions from an angled tray on an aisle into a bag, you might pop into the garden with a stout fork. Our ability simply to buy whatever food we want, rather than to have to grow it or gather it or wait until it is in season, is relatively recent in the long annals of our human history. One of my favourite places to go on holiday is Italy. In one particular village, Acciaroli on Italy’s southern coast, the population seems to have discovered the secret of longevity, often living until well over 100. The village has outstanding views, good fish and locally grown fruit and vegetables. They garden and stay active. They don’t eat much meat and the men head off into the fields in the morning. Age – the number at least – is not a limiting factor. 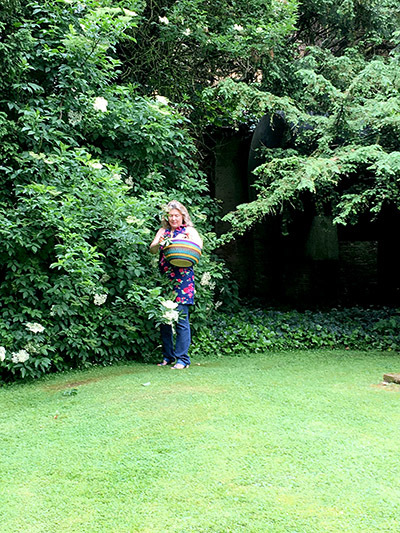 A new member of our team – Sam (Samantha) has joined us in the last few months and has moved into a cottage with a long garden. The previous lady had not been able to look after it any more so it needed a certain amount of work although it had been loved and tended in the past. Murph and Sam had not had a garden before and wondered which plants were weeds and which were worth keeping. Learning quickly, they realised there were many plants and vegetables hidden away, as well as Lupins and other flowers. They are now often out gardening long into the evenings and have onions, potatoes, some good looking fruit and some rhubarb which I gave them as a starter. (Easy to grow, hard to get wrong and good to eat). Philip looks after our vegetable garden – Geordie and I used to do it but in last four or five years we have really run out of time. 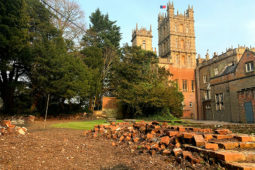 Downton Abbey included a scene about a local flower show and such shows are still eagerly attended all over the country. I will never forget stories from the Garden Museum in Lambeth, London, where I saw a medal for the best marrow grown in the trenches during the First World War. 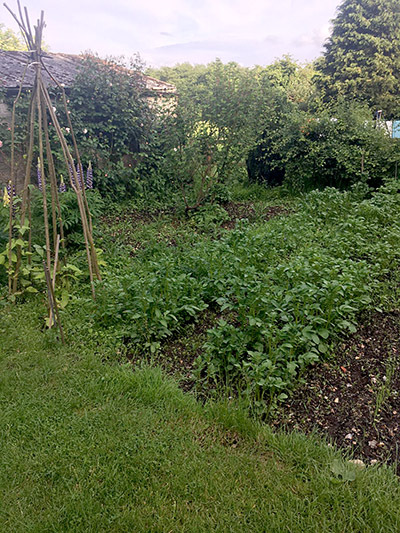 I was amazed, yet thought again because growing vegetables is something to look forward to each evening. There is also a surviving military medal in the Imperial War Museum — not for valour, but for First Prize in tomatoes at the Le Havre vegetable show in 1918. I hope the Garden Museum may come and tell us about some of their stories this September at our Heroes at Highclere weekend. 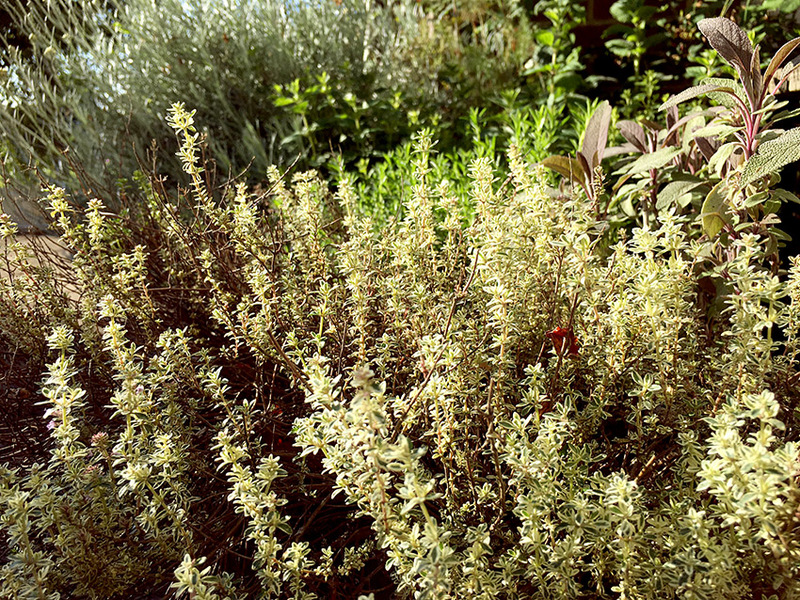 I grow masses of herbs – they calm, heal and restore. 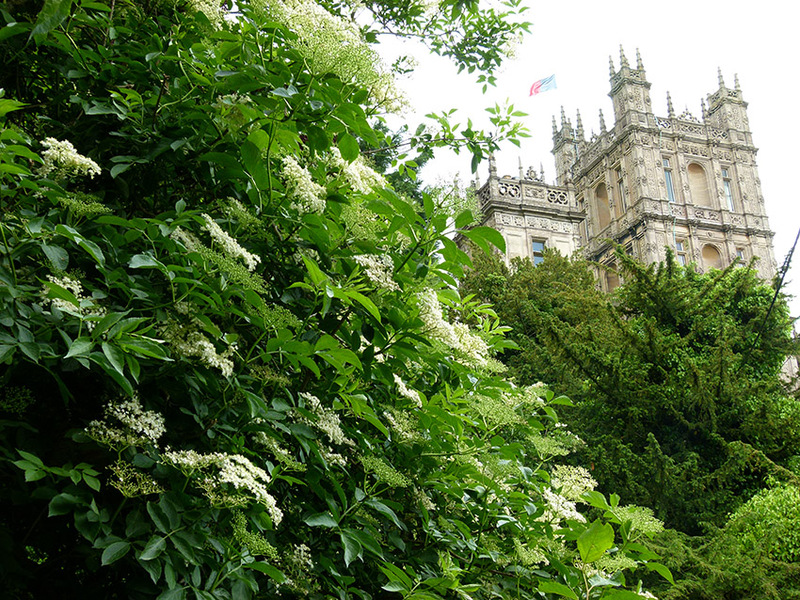 Here at Highclere, elderflower grows around the old church as well as in our hedgerows. I can usually pull down enough branches to pick some white scented heads without the recourse of ladders. Rob, one of our chefs in the kitchen, has kindly got me some citric acid and I just need lemons and sugar. It does seem that summer is indeed upon us. Making elderflower cordial is very satisfying and it is delicious. I would, however, be more likely to win “brownie points” for that than my runner beans and peas which I tend to just pick and eat but I don’t think I’m ever going to get quite so far as a prize at a vegetable show! A friend of mine made elderflower champagne once, it was so fizzy and the smell was wonderful, we found this out one evening in his garage we popped the cork one of the bottles, the cork burst out like a rocket, hit the ceiling, bounced of the wall and hit the other bottles setting them off too. We were covered in homemade elderflower champagne. There was a BBC TV Programme called Fruity Passions and a book written Margaret Vaughan, he said he had followed the recipe by the book some how I think not. There is food out there if you look for it just like the old days back in history. The scent of elderflowers is amazing! In this crazy, seemingly insane world, your blogs and videos bring me right back to peace and calm. Gentle, beautiful reminders of the beauty that surrounds us if we will stop and breathe for a moment. Thanks from Canada! Years ago I made elderflower champagne, with great success. I usually buy the cordial nowadays but your article has romanticised me into giving the homemade cordial a go, thankyou for reminding me of the simple pleasures in life. I had a glass of delicious elderflower cordial on Thursday evening, made by the young lady, Alice Charrington, who runs the tearoom adjacent to our bookshop. I had simply forgotten how refreshing it is on a hot evening ~~~ lovely. As are runner beans and freshly picked peas of course..! Your vegetable garden looks grand, I am green with envy. Philip is a very talented gardener -Downton needed a gardener didn’t it? Beautiful flower! Brings wishes of being there in England. Loved seeing the many displays of flowers when I was there in 2014. You have a great home and grounds. I so enjoyed reading this and the pictures were so wonderful I could almost smell the fragrance of the flowers. I grew up in North West Ohio by parents who lived through the Great Depression. 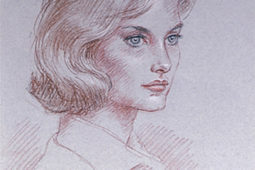 I was born in 1949, right after the war. Since money was scarce, our family entertainment in the spring was to go for a drive in the country to search for Elderberries on the roadside. I don’t think my Parents knew they could make use of the flowers! We always had a garden and made use of every bit of it. Waste was not allowed. Who knew they could have harvested the flowers from any plants. I always learn something from you blog, today was no exception. My Father would have loved this! Thank you for posting such an interesting story. I love seeing the pictures of the grounds surrounding Highclere that we can only view through your camera lens! 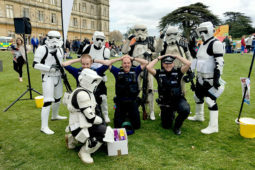 Looking forward to Heroes at Highclere! Thank you. It gives us a great deal of pleasure. This recipe looks lovely and my only regret is that the flower is not indigenous to my home. I noticed that many magazines suggested serving elderflower champagne cocktails for brunches for the Royal Wedding of Prince Harry and Meghan Markle. This must be due to the “Englishness” of elderflower cordial. I so wish I had served these for my brunch, but I did serve champagne for a toast. With summer coming and maybe a luncheon or two I am inspired to purchase elderflower cordial as a treat. Yours looks absolutely scrumptious and it is amazing how easy it is to make. I love your recipes and am always eager to see your newest one. Happy Summer to all at Highclere Castle!!! Thinking back on it, I seem to recall that the flavor of the wedding cake of the Duke and Duchess of Sussex was elderflower and lemon. I remember that this was the reason for the recommendation of elderflower cocktails. So it is a good flavor for cakes too, even Royal ones!!! After watching the video of you making the Elderflower cordial I’ve had to buy some. I’ve now watched all of the cooking with Lady Carnarvon videos. I think my favourite is the summer fruit crumble. I think you should do a cooking video with you and your head chef. I will do I have planned some more recipes and will book in our filming day ! back then when War changed the world. We have a flower that is in bloom now called Queen Anne’s Lace. It is a wildflower and looks exactly like your Elderflowers. Could it be the same and if it is, I’m off this evening to the market for citric acid, because they are especially prolific this year, growing even by the side of most roads. 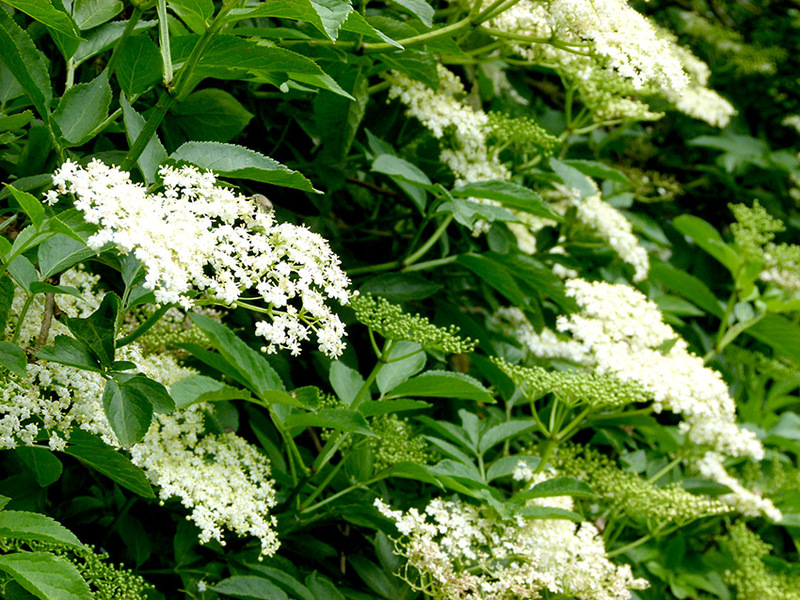 I’ve searched the web and can’t quite make a determination if Elderflower and Queen Anne’s Lace are one in the same. What you prepared looks so refreshing! I didn’t know elderflower cordial until I moved to England, and now I simply love it! I must give a homemade cordial a go. (But first, to find out where it could be picked up here in London.) Thank you, Lady Carnarvon, for the wonderful film with the recipe. It is a good year with lots flowering in hedgerows! What is the best of living in a castle ? Do you have any summer cottage? I made Elderflower Cordial yesterday. It was easy and delicious. My first attempt. I have made Elderberry jam in the past and never knew I could use the flowers for this. So excited to learn about this treat. When I first saw your blog on this subject I thought oh we don’t have those in the US, and then a friend told me she thought it was the flowers before the berries. Who knew!! Thank you. Love your recipes. Please share your elderberry jam recipe!! The Elderflowers at Highclere are just beautiful. Which in Spanish we call “saoco”; now I know! They look a little like jasmine. I don’t know if they belong to the same family. Your recipe for the cordial is very nice. You have a lovely garden. Dear lady Carnarvon! 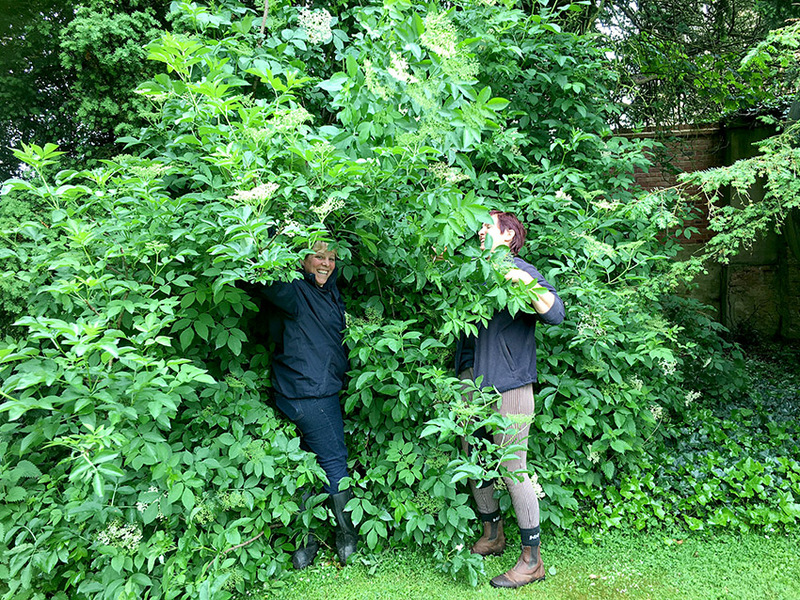 My great-grandmother(b.1870) and a midwife, in Bohemia, had a saying about Elderflower ” Tip your hat to rose bush, kneel and bow to Elderflower.” Its properties were always the most important in the folk “field” Apothecary. I read your story and smile. Thank you! What an amazing haven of calm, joy and love for all! You created a place to safely turn to. One enters here to be invited into beauty and comfort of your personality, Your inspired thoughts and endeavors. I just signed up to be able to wake up and, with one short staccato click, enter your world; All your love of nature, beauty, history is the realm sorely missed on this side of the Atlantic nowadays. Thank you for this extraordinary oasis of beauty, humor, fun, common sense and all things human. I have never made an elderflower cordial, but I have made elderberry cordial. It is not a light refreshing drink for summer, rather it is dark and what I would describe as “heavy”. It is not a taste I enjoy because it has a lot of cloves in it, but I use it mainly for medicinal reasons since it is highly effective in knocking down colds, flu, sore throat and all those icky feelings that come over us in the winter months. I often shared the cordial with a friend who raised six children. They are mostly grown now, but they like to tell the stories of how they never faked being sick so they could get out of going to school, because their mother would always give them this elderberry drink which they disliked. My friend makes her own elderberry medicine now and her children have all asked for my recipe as well. The recipe you shared for elderflower cordial is similar to something I make with dandelion flower heads, which is delicious. I have made elderberry cordial later on in the year and like it but it needs to be quite sweet!